As the summer is getting into full swing, I am always craving to be outside this time of year. It’s the season to have a party in the backyard with friends gathered around the patio and the smell of meat on the grill. Unfortunately, Amanda and I are apartment bound at the moment and don’t quite have the backyard for epic grilling as our parents do. So, we wanted to cook a few dishes that remind us of all the tastes of summer while still being able to use our own kitchens. When I think of summer foods, burgers on the grill are one of the first things that comes to mind. How could I compete though with that chargrilled flavor that only fire (which I didn’t have) could provide? So, I wanted to make something that was still a burger, but with a twist. I’m also feeling the consequences of my structureless diet as of late, so I wanted to make something that might have a bit extra to freeze for later, and wouldn’t mess with my waistline. So, I present to you: The sweet potato and black bean burger! I had never had a veggie burger of any sort before this, and I must say, this is something I’m going to add to my regular meal rotation for sure. Roll handfuls of the mixture into balls and flatten to form a patty-repeat until you have 8 patties about 3/4″ thick. Place patty in a pan and cook on each side for 2-3 minutes until browned. Enjoy on your favorite bun (I used a pretzel bun), with some avocado or whatever makes you happy! Popcorn is such a wonderful snack. I have always said that even if I am completely full from a large meal, I still can’t resist a handful of popcorn if that buttery scent wafts my way. When Amanda and I have the rare chance to actually see one another in person, we usually like to have a lazy night in front of the television while having some long conversations solving the world’s problems and catching up on each other’s lives. It just so happens that this is also my favorite time to mindlessly munch on something savory. Amanda and I both have a love of chocolate and s’mores as well and so we knew we wanted to dress up popcorn in some way and s’mores are always a favorite. Line a baking sheet with parchment paper or foil (very important as we learned). Spread out the popcorn on the baking sheet and try to remove any uncooked kernels if possible. Crush the graham crackers into small pieces. I prefer to stick them in a zip top bag and pound with a mallet or crush with my hands. In a micowaveable bowl, microwave the chocolate chips in 10-20 second intervals until chocolate is melted and smooth. Drizzle chocolate over the popcorn, and try to avoid large globs. As you can see from our photo though, it’s not always possible. Then, while chocolate is still liquefied, sprinkle the graham crackers and marshmallows over the popcorn. Try to resist chowing down, and allow chocolate to harden. You could stick the pan in the fridge for fifteen minutes, and that usually does the trick. To serve, you can eat straight off the baking sheet or break into smaller clumps and munch from a bowl. Enjoy! Welcome to summer! Unfortunately, my condo complex doesn’t have a grill area and the one time that I tried to use a portable grill on my balcony I may have used too much self-lighting charcoal. 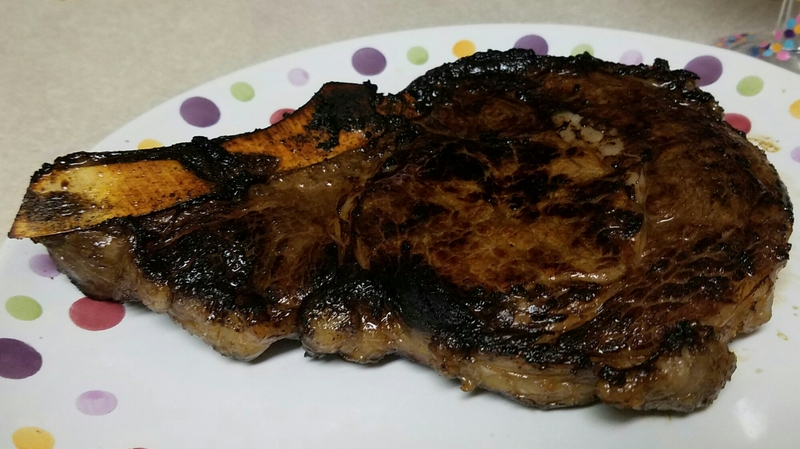 For the a grill taste without compromising the safety of my patio furniture, I decided to put my steak in a liquid smoke marinade.Liquid smoke is a natural additive made from water infused with hickory smoke. You can find it in most grocery stores near the barbecue sauce. Its also good in slow-cooked chilis! Though marinating meat can also tenderize, the main purpose of marinades are to add flavor. Typically, they are composed of an acid + an oil + flavorings. Acids can be vinegar, wine, juice, or even yogurt (like in Chicken Tikka Masala). More on marinades to come in another post! Combine marinade ingredients and add to steaks in large Ziploc bag. Chill in fridge for at least four hours or overnight. Once done marinading, remove steaks from bag onto a cutting board and discard marinade. Pat steaks dry with paper towel. This allows for the steak to better sear in the pan. Heat oil in pan over medium heat. I use a non-stick skiller, but cast iron pans are the “ideal”. Flip steak after desired time has passed. Tongs work best for keeping the juices in the steak (and not flopping your steak out of the pan in the process). If desired, add more butter. Remove steak from pan and allow to rest 5-10 minutes before serving. 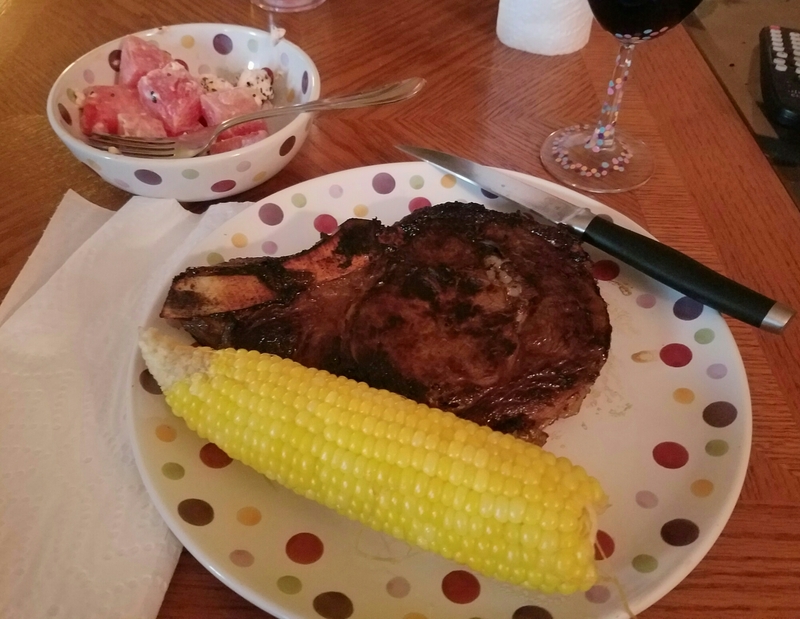 Side Dishes: In keeping with the summery theme, I boiled some corn on the cob. This is a pretty low-maintenance but delicious side dish, with the corn being boiled for about 10 minutes. I also had watermelon salad with goat cheese. I think feta would be better next time, since the cheese crumbles better! Wine Pairing: Between the richness of the steak flavors, liquid smoke seasoning, and the char that comes from the pan-frying process, a bold red worked best. I had a Malbec from my local winery, made with grapes from Oregon. Malbec has more fruit flavors than another bold red like a Cabernet, but with the same smoky, tannin taste that pairs well with steak and other grilled foods! Indian food is my favorite cuisine – the flavors are so complex and warm. Chicken tikka masala is a great introductory dish for someone unfamiliar with Indian cuisine. The familiar tomato based sauce and glorious spicy smell will win over even the most suspicious and picky eater! This recipe is an adaptation from Christine Ha’s Recipes from my Home Kitchen, which Merideth got me for Christmas this past year! An “adaptation” because it has my new favorite secret ingredient: fenugreek! When I was in Boston earlier this spring, I happened to grab a barstool next to a Nepalese chef visit for “research” (excellent excuse to tour Boston’s culinary scene!). I told him about my favorite tikka masala dish and he gave me three suggestions: 1) marinate the chicken overnight instead of the hour that this recipe instructs; 2) don’t discard the marinade when adding in the chicken; and 3), use fenugreek! I added 1 tablespoon to have a similar balance with the other spices. 1 teaspoon ground red pepper (I substituted red pepper flakes once, but I don’t recommend it since the flavors do not blend as well). 1) In large bowl, combine yogurt, lemon juice, 2 teaspoons of the cumin (half), red pepper, pepper, ginger, cinnamon, and salt. Add the chicken and marinate overnight (or at least one hour). 2) In a large saucepan, melt the butter, stir in garlic, and cook. Add paprika , remaining cumin, and salt to taste. Stir in the tomato sauce and cream and simmer for 20 minutes, or until the sauce thickens. 3) Add the chicken to the simmering sauce for an additional 10 minutes. Serve over basmati rice. I also serve it with fresh baked naan (more info on naan to come)! For this dish, we paired with a nice merlot. Not toobold, but complimented the flavors nicely with it’s slightly spicy flavor and hints of berries–it matched the spiciness of the dish while also adding calming notes between bites.